Play and Earn Paytm Cash Sabse Smart Kaun:- Sabse Smart Kaun is the reality show telecasting on Star Plus and streaming live on Hotstar App. After streaming "Watch N Play" IPL live game show, now Hotstar has come back with exciting quiz game play where you can earn paytm cash by just "touching" the right answer on your android smartphones. "Sabse Smart Kaun" show will daily give a chance to play and earn paytm money by playing the live game on Hotstar App and scoring the highest points. Play Sabse Smart Kaun on Hotstar - This Hotstar, Star Plus Sabse Smart Kaun Game Show is entirely based on your "common sense". So if you are trying to search any trick to win in Sabse Smart Kaun Game. Then forgot about it and play it with your brain. So why don't you use your common sense and earn few paytm cash easily scoring some points in some steps on the Hotstar app and then convert these points into real paytm cash. Play and Earn simply means that you'll be playing live with Ravi Dubey who is the host of this "Sabse Smart Kaun" Game Show. That is known as "Play-along on Hotstar App". Like you have played for Watch N Play in IPL season. Sabse Smart Kaun is a Hindi Reality Show Currently airing on Star Plus. This show is hosted by Ravi Dubey. It is a Fun Photo-Quiz Game show where two families compete against each other over brain-teasing pictorial puzzles for huge money. The Watch N Play with Sabse Smart Kaun play-along feature enables the viewers to participate in each round using their smartphones(mobile). Playing Sabse Smart Kaun on Hotstar App can give a chance to earn daily up to Rs. 15 lakhs. Read the rules of playing this pictorial puzzles in the below. However, you have to very quick while selecting, opting for your answer from the pictures which has shown to you during the play show on Hotstar on your "Mobile". As there are few rules that you'll lose some money with every second if you'll take more time to answer that particular picture question. Since the answers lie within the picture itself. So beware of this rule that you have to answer the question correctly using your common sense in a few seconds. How To Register For Sabse Smart Kaun on Hotstar? So to play Sabse Smart Kaun online on your Mobile phones. 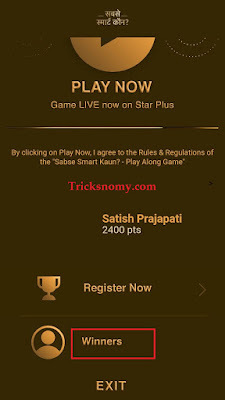 You need to download the "Sabse Smart Kaun App" to play this game that has been telecasting on Star Plus and the Sabse Smart Kaun App is popularly known as HotStar App. Some of you have been thinking or Googling it on Google that is there any apk app for Sabse Smart Kaun quiz game to play this quiz online? So you need to download HotStar app aka Sabse Smart Kaun App Download to play this game online sitting at your home. First of all Download the Sabse Smart App Apk i.e Hotstar App. After this Open the Hotstar and Click on "Three Bars" Upper Left Corner. Now Login or Sign Up on Hotstar. To Play Sabse Smart Kaun, Search "Search Smart Kaun" in the search bar. Or you can see the Banner of "Sabse Smart Kaun" Flashing Live at Correct 6:30 PM. Now Click on the Live Banner, you'll see "Play Now" Option. 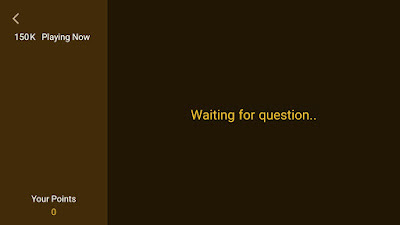 .After this you'll see "Waiting For the Question", Now wait till then question flash on your smartphone. You can see the below to understand it clearly. No, Need to enter Pan Card details, Simply Enter Phone Number and Submit. How To Play and Earn Paytm Cash On Sabse Smart Kaun HotStar? 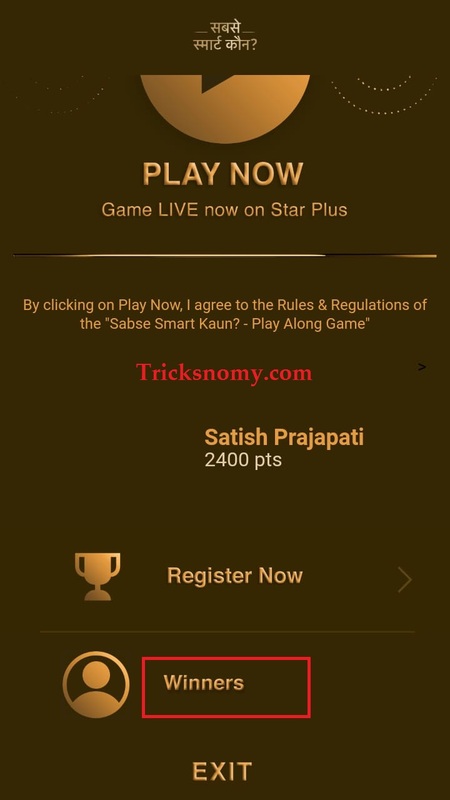 Sabse Smart Kaun Game is easy to play on Hotstar. Just be active at the right time when the game starts. Open you Hotstar and wait for the question to appear on your smartphones. Of course, you can play "Sabse Smart Kaun at Home" with your Smartphone. Quickly use your brain and answer the question correctly. For every right answer, you'll get some points in Hotstar app. Later you can convert these points into paytm cash. Remember this the game is based on daily-basis quiz game like Jio KBC Play Along where your points changes to zero after every ending episode. Now, wait for the live game show on Hotstar. The game will be live every Mon-Fri at 6:30 PM. Open your Hotstar app. You'll see the Live Banner of Sabse Smart Kaun Click on it. Earn points for every correct answer. Later convert these points into paytm cash by playing the game. To Redeem Paytm Cash from Sabse Smart Kaun Game Show. Obviously, you have to score high points during the game show. After scoring the highest points if you are a winner then you'll see the redemption for paytm cash option there. By choosing that option you can redeem your earned paytm cash on hotstar's sabse smart kaun. Converting winning points from Sabse Smart Kaun to paytm is liable to some rules. According to the rules of converting points is same as competing with highest point scorer. That means if someone has scored more than you in the same quiz or questions then he/she will be the winner. So how many points do you need to be winner? Till now Hotstar's Sabse Smart Kaun Game is not showing the winner's list. But they are promising to credit the paytm cash to their paytm account if anyone has scored required points to win this Watch N Play Game with Sabse Smart Kaun. What are the Rules for Playing Sabse Smart Kaun on Hotstar App? Rules of playing Sabse Smart Kaun on Hotstar is simple. As we told you earlier in the same post that you have to wait for the live game show that should be streaming live on Hotstar app. After that there you'll see "Play Now" option just click on this and wait for the questions to appear. Be quick, read the questions properly and then touch/choose the correct option. For every correct answer, you'll get some points. With every wrong answer, you'll get zero points. Now you must be wondering on how much points you can earn paytm cash? Or How much points you can "convert into paytm cash" for this read the following rules below. How Many Points Do you need to be Winner on Hotstar? According to their rules, you need to score higher for every correct answer. Let suppose that you have earned some points in today game show then there will be a "Lucky Draw" which show the leader-board of highest scoring points. If you got the highest points in Sabse Smart Kaun Game show then the money will be transferred to your Paytm account. Even though you have earned some points in today's game show then it'll be zero in the next game show. That simply means you need to give correct answers to every question in minimum seconds to compete with the live playing players of this game app. After that, if you are the winner according to their Lucky Draw Leader-Board Highest Scorer then money will be credited to your Paytm Account. 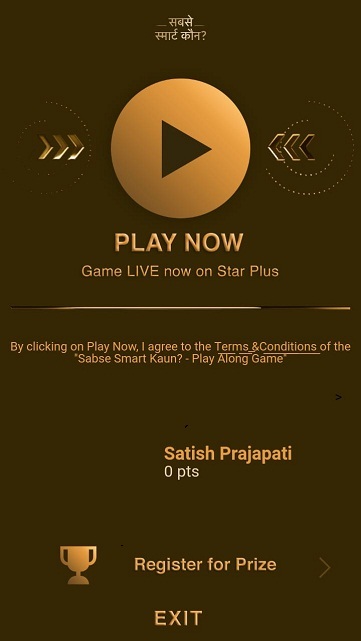 Since we have already read all the rules to play this "Sabse Smart Kaun" aka "SSK" Games Show on HotStar and exploring more to know how you can convert these earned points into cash. You must be also thinking about how much cash it'll be if we convert the value of 1 points. Let me tell you that the points are given according to the prize money of those questions which are being asked in every round. Suppose that in the first round the first question is for 1 Lakh rupees then on your hotstar app the same questions will be for the 1000 points for you. If I am not wrong then 1 points will cost you 0.01 rupees for the question which has shown to you on HotStar app. So I hope now this doubt has been cleared for some people. But I think this is not a practical way to determine the winner or for prize fulfillment. Of course, If they will be using this type of pattern for converting points then why the hell they are bragging that a winner can win up to 15 Lakhs. Anyway, let see the below points table where they have given the points, times for each round and every question for how much points you can earn up to, to be the winner. How You Can Score Points? According to the above table, we are going to summarize some main points here so that you can keep these points into your mind to score higher in the Play along with SSK (Sabse Smart Kaun) Game Show. With the higher points scorer, there will be more chance to be the Winner of SSK Game on HotStar App. The Participant(s) may win points as per the table in the point above, as provided for within the Hotstar App for every correct answer. No points will be lost in respect of incorrect answers provided by the Participant. The Participant’s winnings may reduce due to any technical factors such as time lags, volume of traffic etc. Participant points that are available and logged with the Company on the Company’s servers shall be final and binding on all Participants. In the event where the actual outcome of the question displayed during the episode is different from the answer displayed on the Participant’s device, the relevant points will be granted to Participants who have selected either of answer options. The Company shall not be responsible for any loss of points due to change in Device and/or email ID and/or Facebook ID. The Company shall not entertain any claims for any such losses. There could a difference between the time visible on the Game’s User interface and the respective points awarded to the Users. This difference could be due milliseconds taken to answer the respective questions. In all such cases, the time taken as per the server shall be final. Every eligible winner will be rewarded at the end of each episode. A total of INR 15 Lakhs will be rewarded as the prize money across all winners of that particular Episode. 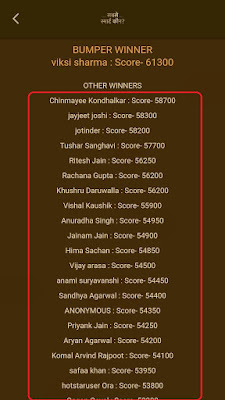 Whosoever has scored higher points in Leaderboard. Total Prize money will be distributed among the top points scorer of the game in every episode. A leaderboard for the SSK Game Play will be maintained for each episode of Sabse Smart Kaun on HotStar highlighting the rankings and points of participants during the episode. The Leaderboard will be accessible and Visible along with "SSK Game Play"
Due to technical glitches, high volume traffic, leaderboard may not reflect the true points of the participants. The Company reserve all the right to decide the periodicity of updates of the Leaderboard. The number of those participants rank will be displayed whose points are higher. Not all the participants(s) rank will be displayed whose points do not entitle the prize money. So guys here we have an update again for Sabse Smart Kaun(Kon) play along with Hotstar app. They have shown one of the awaiting "update" that we all people out there who were playing this "Sabse Smart Kaun(Kon)" since in the beginning and waiting for the Leaderboard List to see out the name on it. We were eagerly waiting to see whether our name is listed on it for the points that we have earned for each episode. So today, we saw the flashing banner on the HotStar app that was saying " Winners for the first week will be announced soon". That clearly mention that they will actually announce the winners' name on the weekly basis. Therefore, from now on we can expect the Winners' Leaderboard List on every Friday after the ending of the show. So now we can be sure about this they will notify all the Weekly Winners who have managed to score the Highest Points in Sabse Smart Kaun(Kon). So Keep Playing SABSE SMART KAUN on HOTSTAR APP. As we got to know about that we are expecting to see the Leaderboard of Winners in Today's Show. I hope the Winner Announcement or you can say the "Leaderboard of Sabse Smart Kaun" you can also see this on HotStar App too. Now all of your doubts about Whether Leaderboard will ever show on Sabse Smart Kaun on Hotstar App or not? Will be cleared today. We hope that they will Announce the Winner of SSK Play Along Today. So, guys, they have already updated the HotStar Mobile App and now you can see the Winners Name of "Each Episode" on the HotStar App. Just click on the "Live Game Option" there you'll see "Play Now" option. There are also few options too. Now scroll a bit and you'll see "Winners" option. Click on it and gotcha! There you can see the name of Each Episode Winners. As per expected, they have announced the name of Winners from Episode 1-7 on HotStar Mobile App. You can now check each episode winners name along with their points. Now it has been confirmed that this not a fake game show. So "Keep Playing Sabse Smart Kaun on HotStar App "daily at 6:30 PM Mon-Fri. Who knows you can also be the next winner!. Remember that we are trying to contact them. As we don't have "Sabse Smart Kaun's Contact/Phone Number". If we get some more information regarding this we'll surely update you. Finally, they have announced 1000 of Winners for the Episode 9-10. 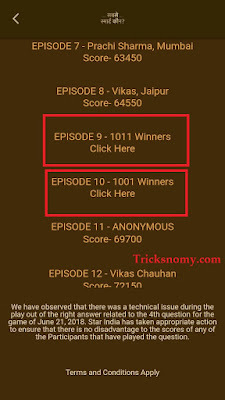 In each episode, they have announced near about 1011 and 1001 Winners Name. Now you can check your name there and see whether you are Winner or not? Now, Whosoever were saying that this game is fake or something. I think now they got their answers. They were facing some technical glitches that's why they were not able to show the "Leaderboard of Sabse Smart Kaun" live on the HotStar Mobile app during the Live Show. If you are one of them who is consistently asking for the points to be the winner in Sabse Smart Kaun? Then now you can check all the details about points of scoring by the Winners announced for the Episode 9-10. Most of them were asking "I have Scored that much points". Now how will I get Paytm Cash and blah..blah things? After announcing the "list of winners in Sabse Smart Kaun". Now people can be assured about that they soon will be able to show the Leaderboard of the Winner's points during the Live online "SSK play along on Mobile". For the prize money, less than INR 1 Lakh - The Prize money will be credited to the Paytm Account to the respective participant's PayTm Account. Make sure that you have already done all the KYC process before receiving the payment into your PayTm. For the Prize money, more than INR 1 Lakh - The Company will transfer the Prize Money after post verification of the KYC documents submitted by the winners through RTGS/ NEFT/ cheques and/or as may be deemed fit by the Company. Absence of KYC verification on PayTm App. Exceeding the allowable monthly limit of the PayTm Wallet. Check the below table for better understanding. As per the official source, you can check it on their Official Website. They have already mentioned it how the prize money will be distributed among the Winners for each episode. A total amount of 15 Lakhs will be awarded as the prize money across all the winners of each episode. Now it confirms that everyone who is playing on the "Play along with SSK" on Hotstar. If he/she score higher points during each episode will be able to get the prize money. For the "Episode 9 & 10 of Sabse Smart Kaun Game Show Winners" have been declared already on the Hotstar. Now they are contacting each winner to provide the Paytm Prize Money. Some of the users have got the Paytm Money. We have seen some screenshots of the "Paytm Proof" that they are crediting the Paytm Cash to the Winners of Episode 9 & 10. Finally! Now you'll be able to see the "leaderboard" in "sabse smart kaun". They have updated it on the latest version of hotstar app. Now, who were searching for the sabse smart kaun leaderboard to check their earned or scored points in sabse smart kaun game show. From now onward they'll be able to check their position according to their earned points in sabse smart kaun online show. We all have been waiting for this leaderboard to be shown on hotstar app. So that we can easily check our points to judge whether we will be going to lead the game for the episode or not. 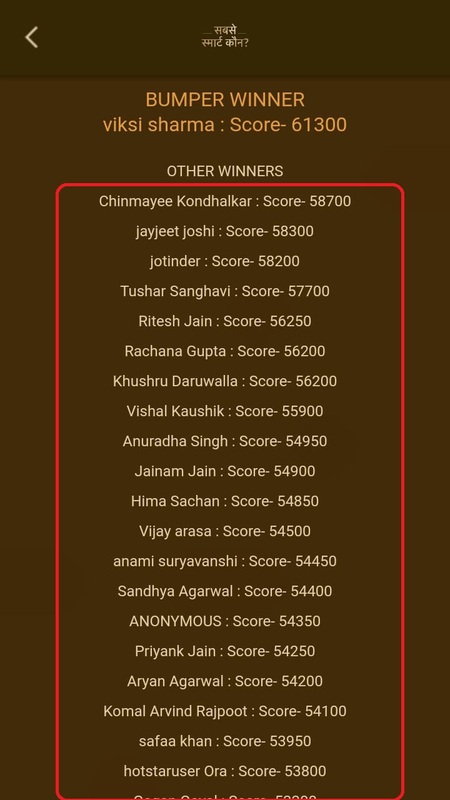 Leaderboard of "sabse smart kon live game" can show your positions on the live game show. Till now you have been searching for such questions "when the leaderboard will be shown in sabse smart kaun? ", "How can we check leaderboard of sabse smart kaun"?. Many of you also commenting for the leaderboard in the comment box. After getting the update of hotstar app now you can check the leaderboard of sabse smart kaun. Is it necessary to provide the PAN details, Phone Number? Yes! It is necessary to provide these details Name and Phone Number. Since we all are watching this SSK Game Show Live on Star Plus Where the Prestigious Host "Ravi Dubey" Keep urging from those people who are playing Sabse Smart Kaun Live on Hotstar Mobile App. So that they can contact to the winners. Can we get Contact Number of Sabse Smart Kaun? Till Now we are still struggling to contact them. But if anyone needs to contact them then they can surely visit their Official Site to get in touch with them. You can also visit their Twitter Handle or Facebook Official Page to ask your doubts. Is it Real that they are providing the Paytm Cash (Prize Money) to the winners? Yes! It is "true" that they are sending Paytm Cash to the eligible winners. After searching in various groups. We got to know that some winners are sharing the snippet of their Paytm transaction details that they actually got the money. So it's "true that Sabse Smart Kaun giving away/crediting" the prize money to their respective winners. What is the Sabse Smart Kaun Play Along Online Timing? To Play Sabse Smart Kaun Live on Hotstar app. You have to be active at 6:30PM Mon-Fri on your Hotstar app to play along sabse smart kaun live. We recommend you to open at "6:28 PM" before the show starts. So that you can't face any Internet or technical issue. The timing of Sabse Smart Kaun Live Game Show is 6:30 PM Mon-Fri on Hotstar App. When I'll get money from Sabse Smart Kaun? Have some patience! If you are winners of Episode 9 & 10 and eagerly waiting for your "Winning amount". Then don't worry they are sending the "Paytm Prize money" as soon as possible. Some of the Episodic winners have already got their Paytm cash. So you'll get soon. Just keep playing Sabse Smart Kaun on HotStar. What are the Score or Points of those Episodic (9&10) Winners? To know about the "Score points of Sabse Smart Kaun's Winners". The same you can check on your HotStar App. There you can easily get to know about the "score of the SSK winners". Why Sabse Smart Kaun Game (Hotstar) has been Suspended? A possible reason for the suspension of the game "Sabse Smart Kaun on Hotstar" is technical glitches as what they are saying in the hotstar app. We all are facing a lot of error while playing this game on the Sabse Smart Kaun App. Most of the people were getting the late Questions on their Hotstar app and complaining this game as "FAKE SHOW" on the various Social platforms. Now from yesterday onwards, We are seeing that GAME SUSPENDED "Hotstar Play Along App is suspended until further notice". And the reason they have displayed on the Hotstar App itself was "Technical Glitches". That's why you all are not able to play sabse smart kaun live on hotstar app. How To Submit the Paytm Number on HotStar (Sabse Smart Kaun)? To submit the "PayTm Number On Sabse Smart Kaun Hotstar" you have to Click on the "Register Now" option and then Enter your PayTm KYC verified Number only. As it'll be easy for them to provide your Winning PayTm Cash directly to your PayTm Wallet. Getting Error While Submitting PAN CARD NUMBER Details on Sabse Smart Kaun HotStar App. Some people who are playing "Sabse Smart Kaun" on HotStar "facing error" while submitting the Pan Card details. It is showing the "Reverse of PAN Number" details. So I think this is the bug of HotStar App. Soon the team of Sabse Smart Kaun HotStar App will fix it in my opinion. Try to enter/submit details later or after the game end. Maybe due to a high volume of traffic. Few users are facing such issue. So please don't try to enter PAN number details on the peak time of the Game Show. Enter your PAN details before or after the Game Show. How To Redeem the Earned Points into PayTm Cash of Sabse Smart Kaun HotStar? To redeem the points of Sabse Smart Kaun on HotStar. You don't have to do anything. Sabse Smart Kaun Official Team will automatically convert your Points into PayTm Cash if you have scored highest points to be a winner on sabse smart kaun. "Redemption of earned/scored points" will be done by the official team itself. You just have to play and earn highest points in the Sabse Smart Kaun Game Show. Why there are two specials questions for the HotStar play along users? On the hotstar app now you can see the two special questions for the "SSK PLAY ALONG USERS". Users who are playing live sabse smart kaun on hotstar app sitting at their home. Now they'll see some "Hotstar Exclusive Question" on their hotstar app. By answering these two questions they can earn some extra points. Which will be helpful to distinguish amongst the high scorer of the particular episode. How To Check Today's Winners in Sabse Smart Kaun? To check the Today's Winners in Sabse Smart Kaun. You have to open your HotStar App and then seek out the "Leaderboard". There check the Top Scorer. Whoever will have scored the highest points. He/She will be the Winner of Today's Sabse Smart Kaun. How Most of the People Scoring Highest Points Score Within Few Seconds in Sabse Smart Kaun? We have come across to see that many people are scoring full points even for the first question Without losing any points or seconds. How can this be possible? Is sabse smart kaun doing fraud or doing partiality among the participants who are playing live on hotstar app? We can't actually blame "sabse smart kaun" for this as this matter could be the issue of technical glitches due to a high volume of traffic. Or maybe the questions appear to those users solely rely on their devices due to servers. We can only assume that they got their questions to be displayed on their devices on the exact TIMER and they instantly click on the "Smart Touch". 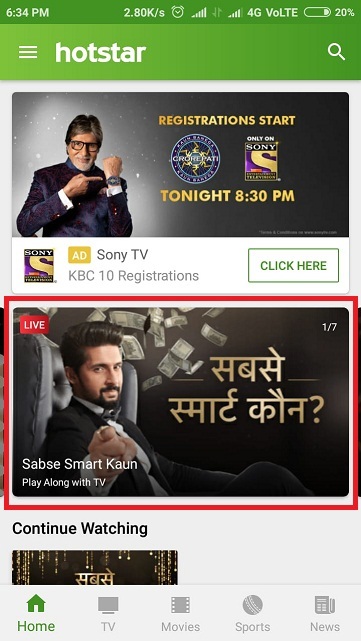 We have also heard some rumors that Hotstar Premium users are getting the Sabse Smart Kaun's Questions a few seconds or minutes earlier on their device. That's why they were able to touch the right answer that could be Smart Touch for them. So we'd like to tell you to play this live sabse smart Kaun game on a hotstar premium account. We are only assuming this fact that they are getting the questions appears to them before the normal users of hotstar. This could be completely worthless to say. But we have heard this rumors on various platforms. How To Score Highest Points in Sabse Smart Kaun? To Score highest points you need to carefully Read the questions on your Hotstar app or you can use your TV screen to watch it live and read or hear the question properly and touch the correct answer on the hotstar app. There isn't any trick to get higher points except having the good Internet connectivity. If you are having better Internet connectivity for playing Sabse Smart Kaun Game on Hotstar then you can easily score higher points. Some of the users are also claiming that having the Hotstar Premium Account will give a chance to see the questions a few seconds/minutes before than normal users of Hotstar. If you're having the Premium Account of Hotstar then you can give it a try. But I think soon this Technical glitches will be fixed by the sabse smart kaun official team of hotstar. Hotstar Play Along App is Suspended? When you'll be able to Play Sabse Smart Kaun on Hotstar App? Right Now the Sabse Smart Kaun Live Game Show on Hotstar has been suspended due to some technical glitches. This Hotstar Play-Along App will be suspended until the further notice. So please be patient. Since the most of the users were getting fraud calls to submit extra money to get their winning amount. To resolve such issues Live Play of Sabse Smart Kaun Game on Hotstar has been suspended due to technical glitches. Hope they soon will resolve this issue to provide you again a chance to play this game live on the app. When We Will Get Money From Sabse Smart Kaun on HotStar App? We all are searching everywhere about this question whether Sabse Smart Kaun "Play Along With Tv" users will get Money or not? As we have seen that they have provided the PayTM Cash to the Episodic Winners of Episode 9-10. So let me tell you one thing that on their Official Rules Page they have mentioned that the only highest scoring points participant will get the money/prize amount for that particular episode. You all can check that too. So please try to score more to be eligible for winning paytm amount. I hope they'll soon introduce any runner-up prizes. We can only assume this. This is our guess only. Maybe they can introduce this or maybe not. So stay tuned and keep playing ssk play along on hotstar. FB Research App Earn PayPal Cash. How To Create and Verify PayPal Account in India. Vigo Video App Earn PayPal Cash. Getting Less Time Limit than the Actual Time Limit for the Questions on HotStar App? Most of the users/participants are getting less time limit for the questions. 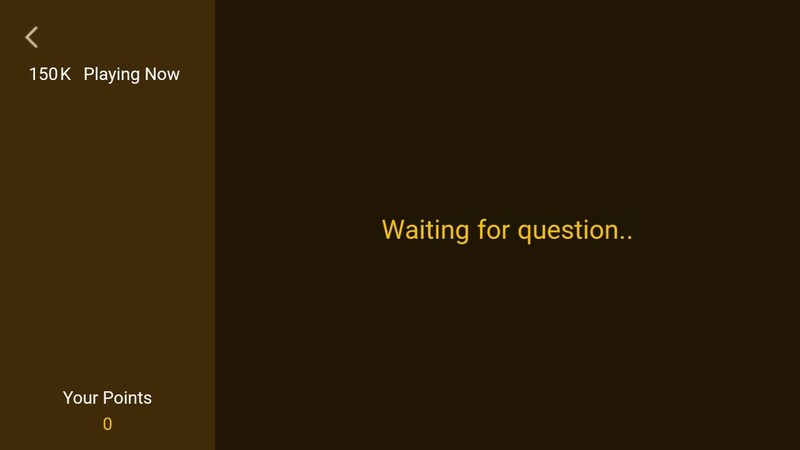 Sometimes they are getting the ZERO seconds for answering the questions on Hotstar App. They have also found that the "Time Counter" is showing less seconds for answering the questions. That's why they are not able to play this sabse smart kaun game show. So due to the high volume of traffic on the hotstar app causing such an error for freezing the time counter or showing the less time limit or less seconds limit for the question. I think they (official team) were also experimenting with the Hotstar Exclusive Questions that can also be one of the reasons for such issue. "This is Not the Official Website. We Are No Way Linked or Affiliated to Star Plus or Sabse Smart Kaun show. We are only providing the legit information shared by STAR INDIA & Hotstar and available on the Internet. " If you want to watch the live show then you can also do that on Hotstar app. Play and Earn Paytm Cash on Sabse Smart Kaun is the best way of earning sound paytm cash by just using your common sense and brain to answer the question correctly in few seconds. Score more points by giving the right answer in less time to earn more paytm cash. I dont think so kisi ko bhe paise mile hain..
Ma'am ! There will be only one winner in each game show whoever will score higher points for giving all correct answer in less elapsing seconds, as per the rule. Aap rule toh padhiye.. Kaafi pechida hain par ek hi winner banega jaise TV mein Second round ke baad highest lead (highest money jeetne wala) karta hai. Wahi third round ke liye eligible hota hai...! Read the rules..!! She says true because in show only two player and in apps in million players only one. As per information if 1000 points =10 rupees so how possible to earn 14 lakh ???? May be only this done for more views point hot by channel and show. So does the Host Ravi Dubey say.. That every Indian people out there can be the winner of this show. But he didn't entirely quoted that only one person can win 14 lakh INR during the Play along with SSK(Sabse Smart Kaun) on HotStar. They have append their list of rules when they have mentioned that the 14 lakh will be distributed among the highest scoring points people on the Leaderboard not only the one people. Unlike the Live Game Show on Star Plus. Hey Admin. I won 35000 points in the last show and 28650 points in today's show. How can I see leadership board to know how much points the winner is getting? How much value of 1 point if it converts in cash. Already updated the post ! You can read the post carefully to see the answer of your question. Thanks for confirming this thing that at least you get the chance to win the prize money. Do let us know about the further details of their contacting to you. And please share the snippet of proof of that you have actually won the Game show. So that people can rely on this Game Show too. Pankhuri Ji ! They are promising to display the name of the highest points scorer at the end of every episode. I have updated the post with their official Terms and Conditions. Where they have mentioned that they'll only show the Leaderboard to those participants who are high points scorer. They have also mentioned that the mere inclusion of less points gainer will be not able to see the leaderboard. They have also agreed on this point that sometime due to some technical glitches participants won't be able to see the leaderboard properly. I hope this has cleared you all doubt ! Atleast declare winner's name including their point at the end of show on Friday... It will encourage continue to play. Mini Saji ji ! We all are waiting for this. But I think they are not able to handle such a huge volume of traffic on their HotStar app. That's why they are not capable of showing Leaderboard. I hope they will soon declare the results of first week winners on HotStar. Vijeta Ji ! Read the post carefully. I have updated the post with some information that is provided on their HotStar app. You can read the comment of Pankhuri Ji. I have replied her comment with the answer which you are also looking for. Enter your comment...i have read all the post carefully. or vah kahi nhi likha h ki at the end of the game kitne log winner ho sakte h (1 2 3 ya usse zada ) i just wanted to know ki agar hum har game me jitne pnts earn karte h vo next day 0 ho jate h to kya vo vale bhi badme paytm cash me transfer honge ya nhi ...please ans sir!!! Yesterday i got 2000 points so muje nhi milega kya ye points ? Whatever points you earned in each episode that will only liable to that particular SSK PLAY ALONG ON HOTSTAR Game Epidsode. Until and Unless you become the top points scorer of that episode. Later on, means in the next episode you have to start it from Zero points. If answer is given in few seconds it will show error. Even though ,10 Sec are remaining. That can be possible due to high volume traffic on Hotstar app. They have also mentioned this things in their terms and conditions. Today I played the game online.for one question I answered within the time,they we're 8 sec left and I answered to it.but a message got displayed saying "an error got occuredo while subbmiting your answer" and I didn't get any point for that. Sarojini Naidu Ji !! Yes that can be possible. While reading their terms and conditions I have encountered this point too that they won't be responsible for any kind of glitches occurred during your ssk game play on hotstar app as there will be high volume of traffic so such kinds of glitches like network failure,server issues, might be happend with participants. So they are requested to set the brightness of their smartphone to the certain amount for graphic purpose and the device should be charged properly throughout the game play. I am trying to login every time I am entering every details properly even then it is not showing my name as it is shown to everyone please solve my problem I got 65000 points on Friday but because of this problem i couldnotget anything. yesterday i got 12500 point but no money and no rply i received. Read the below comments Brijesh Kumar Ji..!! what is the point of first ten winners yesterday? Yet to be announced by the SSK PLAY ALONG HOTSTAR!app.Soon they will release the list of highest points scorer. They are trying to tackle high volume of traffic on their app.As soon this issue will be solved they will keep showing the leader board during live game show. Wait for the Weekly Update. I think they are fixing this issue of Leader board as soon as possible. Don't worry soon you'll be able to see Leader Board of highest points scorer. if we found any information regarding this then we'll update the post as early as possible. Yesterday I logged in late, I was able to play the last question which was for 50lac , I got 10000 points . I'm I eligible for prize?? Can I log in another device ?? Vaishali Ji.. Just giving only one correct answer to the questions doesn't decide that you're the higher score until and unless you see the Leader board score. They have given an update that first week highest scorer name will be announced soon..
Before uttering any foul words..! Be sure from your side. They have already mentioned that they are getting huge volume of traffic that's why they are facing technical glitches. Therefore some people may not be able to see slide banner due to server issues. In my case end of the episode message desplayed mau be u r elizible for todays prize but after that no information given for prize. May be that means you are not in the list of high points scorer players. Keep playing.. They are updating their HotStar for this SSK Play Along Game..
Yadi Aisa hota hai to Hume pta rhega ki hum kitne points se piche chal rhe hai jaisa ki TV show me hota hai. Hello Pankaj Nath Raut Ji !! Aap Jald hi TOP SCORER ke points SSK HotStar App pe dekh paaenge. Sabse Smart Kaun ke log iss par kaam kare rhe hain. 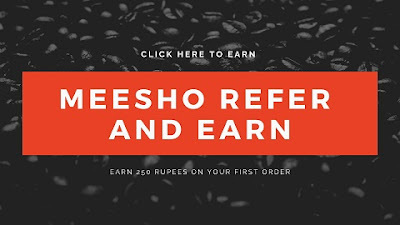 Humare blog pe nazar rakhiye jaise hi koi information milegi hum puri koshish karenge ki aapko turant update karaya jaaye !! Dear admin, participants are very frustrated just because they are not clear about the picture. It is the responsibility of show organizers to resolve all the problems related to heavy traffic while play and should not delay in declaration of winners. It makes no anxiety if one receives his prize money after 6-7 days of play. They should update the list of winners offer every episode. Ji Vipin Tiwari Ji..!! Agreed with yours views. Even I am trying to contact them(Sasbse Smart Kaun Team) via Email as they are not responding on their Contact Numbers. They are just improving their hotstar app play along. We'll soon able to see Leaderboard or Winner List on the Hotstar App. For daily updates keep on checking the HotStar app. We are expecting they will resolve their issues soon..!! राहुल सिंग जी!! आप पोस्ट को ध्यान से पढे सबसे स्मार्ट कौन पोस्ट में मैंने बताया है की कब और किस स्थिति में बैंक में पैसे ट्रान्सफर होंगे अगर आप सबसे स्मार्ट कौन हॉटस्टार प्ले अलोंग पर विनर बनते हैं ! कृपया एक बार पोस्ट ध्यान से पढ़ें ! During play Countdown starts from 15 seconds and they have mentioned that time limit is 20 seconds. What's the problem? Wait for their response ! They are improving their Internal flaws. As we all are not able to see the Leaderboard of Highest Points Scorer. Soon they'll fix this and we'll update you with the post. Update your hotstar app and make sure that your net connectivity is good during the game show. Remember that you don't keep any other applications running in background except Hotstar app. Rest hotstar and Star Pvt. are responsible for this. You can't blame anyone. Even they are not forcing you to play their game. You can walk out from that if you don't want to play !! As they haven't shown us the leaderboard till now. So we can't randomly say that how many winners will be there. May be there will Top 10 Highest Points Scorer be winner for each episode of may be 5 Top Scorer. Stay tuned with this post. We'll update the post as soon we get an update regarding this. How to claim prize money..... I got message 2days episode not able to cliam. Thanks for commenting Sneha Ji !! At least you've got the message that you have won in Sabse Smart Kaun. Have some patience they soon will contact to you via Phone or Email if you have provided them while registering on Hotstar. Shekar Raj ji.. Most of the people also have scored highest points according to them like you have scored. But still we are waiting for the Leaderboard score for the selected winner. As soon as it'll be there you can be assured whether you are winner or not. Have some patience ! Due to my exams I won't be here to reply each and every comments.Any major update will be updated in the post itself. That is all fine whether we get prize money or not bcoz this very nice fun loving game.... I toh loved it?!! Singing Superstar Ji ! Indeed Sabse Smart Kaun is a fun game, playing live this game with HotStar app gives us thrill as if we are playing there on the Live Tv. But still we are waiting for the response of SSK game's Winner. Tried to contact them but still no positive from their side. Hoping soon they'll declare the Winners name. Today i score 20550 so what are the results waiting and confused about last round question can give you max. 50000 points it is correct ? ? Yes for the last round you can only score 50000 points. For the contestants who are actually playing there live on Tv. No cash prize will be decreased with every elapsing seconds. But it'll be reduced the points for SSK Hotstar Play along players with every elapsing seconds. Wait for the Winners announced for the SSK Hotstar Play Along !! We all are waiting for that..!! Any major update will be updated in the post itself. Hey Unknown Ji !! You can do that by updating your HotStar app and Login with your another ID if you are not able to see any Register Now Option. Make sure, this time you are going to add only paytm linked account number. Due to my busy schedule I am not able to publish all the comments with same question tags. When someone has already asked about.So please try to understand and be updated with the post ! mene abhi hi ye game khelna start kia h or glti s dusra no. dal dia to kya m nxt tym no. chng kr skti hu??? So ab Jis-Jis ka Sawal tha ki Leaderboard kyun nahi show ho rha hai Sabse Smart Kaun Game Show ka. Toh shayad aaj Leaderboard show ho jaaye. Aur Winner bhi Announced kar diye jaaye. So Hotstar app ko update kar lo aur ready rho..!! post update kar di gayi hai aaj hi..
Monika Ji ! Leaderboard Show abhi tak nahi hua.. Par Aaj TV par Sabse Smart Kaun Show ke Live Telecast ke dauran Ek Winner ka naam announce kar diya gya tha.. Uss Winner Ka Naam - ANUP KUMAR tha.. Jahaan tak main padh paaya.. Kyunki Scroll Kaafi Fast hua tha.. Aap Dubare se wo Episode HotStar App pe dekhke confirm kar sakti hain..
Ok we got to know that the winner is anoop Kumar but kindly also update the name of winner with their points and the prize money won by them this will encourage others and also help people to play accordingly again with good will. As of now there isn't any option to do that. But still you can try to update your app then Login again and then Register with new Paytm Number. That can be possible if you are taking less time to answer the questions. Luckily if you are giving all the right answers that can be easy for you to score higher points. One more thing, Jackpot question can tremendously change your points from 1K-10K points. "Every thing is not for money, you should have game spirit, you should enjoy the game"
I too earned 29,000 points in yesterday game. promo is being showed before the game started on star plus. This means the episodes are recorded many days before only. So the people sitting as audience in the show or the participants and their relatives or friends will be knowing all answers and they can win easily by playing on hotstar now. Well said.. even I answered each and every questions within 3 or 4secs but I got only 58000 points am sure something is wrong..
Shubham Kumar Ji! I hope they will give some heed on your advice. Rest they are responsible for all prize distribution criteria you and I are no one to lift any fingers on them. Hope they'll provide any update for this too !! I'll try to notify if they announced any update regarding this. Total points in the game is 4000 in 1st round. 12000 in second round. 15000 in third round.and 50000 in final round. So total points are 4000+12000+15000+50000=81000 points. So if anyone is scoring 70000 points then he must be anwering in only 1 second. As it takes atleast 2 second to read question .it means all questiones are leaked of this show. Alok Sharma Ji ! May be your guess is right ! Even I have been thinking this point of view since the day when they'd announced the name of the winners with their points. How could someone be so fast to answer the question correctly within few seconds to manage to score the highest points. But what could be said. They have announced the name of the winners on which criteria still I am unable to enlarge their way ! First When you comment Please use your Name Sir/Ma'am ! Lets come to the point. They have always been giving excuse to us of huge traffic hits on HotStar App. That's why some of the people are not able to give their answers properly. My Answer was correct but still on hotstar app is shown incorrect and not points are given. The Horse question of 21 Jun 2018 episode. I did not find live banner of sabse smart kaun on hotstar app at right time. Vijay Mani Ji.. Check the Episode 9-10 Winners List. Shayad aapka bhi naam ko Winners ki List mein.. Check on the HotStar App. Yesterday I have scored 12000 pts,but it is not clear yet. Mohanty Ji ! Whats not clear... Wait for the episodic winners name list. Keep checking this post regularly !! Hi sir my name is Rajashekhar kya me jansaktahu ki episode 9 and 10 me 1001 winners karke dikayagaya hai and usme Mera nambi hai so kya me eligible Hu Kisi prize money Ka? Shekar Raj Ji. Agar aapn Episode 9 and 10 ki Winners Name mein apna naam check kiya ? Agar aapka naam hai wahan toh aap nischit taur pe Winner hain us Episode ke. Maine Sabse Smart Kaun Episodic Winners List With Points update kar di hai.. Aap post mein check kijiye.. Yes sir there my name in Both episode but still I didn't get any prize money..
Shekar Raj Ji ! Please check your email. Check whether you have got any mail from them ? Else wait for their call.. They will surely contact you soon. hotstar have announced 1000 winner of 15 and 16 june... and by looking at the winner list,there seems a possibility to score higher scores kindly check..
Nitin Sharma Ji... Haan Check kiya par mujhe exams ke wajah se Time nahi mil paaya.. toh abhi post update kar diya hai..Thanks.. 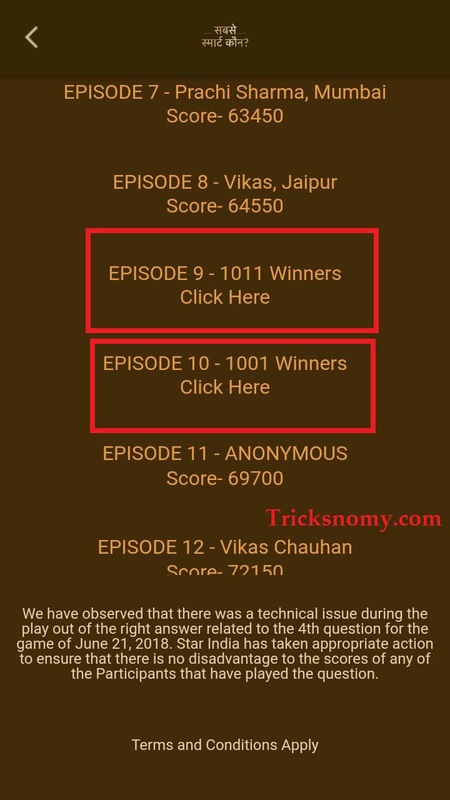 Aap log comments karke bhi ek dusre ki help kar sakte hain..
sirf 9-10 ke liye hi 1000 winners announced hue hn.....Baki episode ke v 1000 winner honge ya only 1?? I have my profile name as Anonymous in sabse smart kaun game. And I see in the prize list there is a winner with Anonymous. How will I know if this is me or someone else? Would anyone drop a official mail or message to me confirming I am winner? And How can I change my profile name now? Still you are doing the same mistake here. As you haven't commented with your name. Now how am i supposed to reply you? But still I am replying because i think that'd be beneficial for others too. Now It's completely your fault. Why didn't you use your "Real Name" there? Now wait for the reply from their side. If they found you that actually you are the same "ANONYMOUS" person then I hope they'll provide you your Winning amount. Payal Jobanputra Ji ! Shayad ye wo log hain Jo TV ke aage baithke khelte hain Mobile Hath mein Leke.. Questions TV pe dekhte hain aur Answer Turant HotStar Mobile App pe dete hain..Bina mobile pe usi question ko Read kiye..Aur samay bacha lete hain aur fatak se Sahi answer ko "Touch" kar dete hain kam samay mein. Aur haan agar aap nahi kar paa rhi hain toh iska matlab ye thodi hai ki Ek Reputed Game show ko Fake aur Mili Bhagat kehne lag jaao.. Pichle Episode 9-10 ke Winners list aur Unke points dekh lijiye.. Andaza ho jaaega aapko..
Baaki sab cheejon ke liye Hotstar aur Star Media liable hai.. Wo jaisa chahe waisa karein... Main toh bas aap sab ko Jaankari deke help kar sakta hun bas..!! We have given right answers to all the questions of episode 18 and we have 42000 points, can I get the prize? Mithlesh Ray Ji ! If you would have scored higher than other participants then you'd be surely going to get the confirmation from them. A small request for star plus..
why don't they invite a winner from any episode of SSK..
Nitin Sharma Ji ! If you have watched previous two episode of the Sabse Smart Kaun then in the End of the Show the Host itself announced the Name of the Winners who have won the prize money of Sabse Smart Kaun for the Previous Episode. If you have paid more attention on the Voice of Host then you got to know that they soon are going to Invite those winners on the Show. Hi sir my peoprob is click the correct answer but is not tucht get few sec why sir? First Update the HotStar App and Be active. Check your Internet Connection as Well. So that you can't miss the touch for Correct Answer. कृपया आप डेलि अपना स्कोर हॉटस्टार ऐप पर चेक कीजिये। officially वो लोग डेलि स्कोर अपडेट कर रहे हैं ! Hello sir u said that they will call me but still I didn't get any call or email.. can u tel me what's happening? wen will I get prize money???? Shekar Raj Ji. I have sent you Invitation on Hangout. Accept it.. Or you can contact us via sending us a Email. I got prize money of 9th episode Thank u so much Team Sabse Smart Kaun.. and waiting for 10th episode prize money..
Shekar Raj Ji. Congratulations !!! On your Winning !! Thanks for Confirming that you got the prize money from Sabse Smart Kaun Team. And thanks a lot for commenting here on our Blog !!! Please use your name while commenting..! As it'll be easy to reply for us..!! By the way congratulations to you on your Winning..! Thanks for confirming this and commenting here to encourage people who are playing Sabse Smart Kaun on HotStar App. Hi admin... you are a good and hard working person...as I can see that you reply to each and every person as soon as possible... making a site is not tough work to do but maintaining it does cost much effort....keep it up....so if you don't mind can I contact you...by other means??? Thanks a ton ! Unknown Ji ! (What am I supposed to call you as you did't mention your name). We are here just providing the legit information by watching the Sabse Smart Kaun Game Show. We are not official but still we are trying hard to explain all the rules and how to play sabse smart kaun game play along in a simple language so that every one can easily understand it and can play this SSK game on their personal ATM. Indeed ! You can contact us freely by sending us a mail. Main thing is how to register on it? I tried 2 times but still its showing "Anonymous". I am using same email ID for hotstar and paytm both but no success. It is only showing "Anonymous" and below that "Register now"
Vimla Ji ! First of all Clear the Data of HotStar app and then try to Login with your Email ID and then check whether its still showing the same "Anonymous". If yes then Update the Hotstar app and this time Login with your Facebook ID. After this click on the "Register Now" button. I hope this will solve your issue. Audition ke liye kya karna padega. Ashish Patel Ji ! Audition ke liye aap kripya Official source se contact keejiye. Kyunki aaj hi Tv pe Information padha ki Log kaafi Fake tareeke se logo Audition or Show mein bhejne ke liye paise thag rhe hain. Toh krupya karke only rely on Official Source of HotStar. Kayi log search kar rhe hain how to go in tv show sabse smart kaun. Aur kayi log isi ka fayda utha ke unhe thag rhe hain. So beware of this thing. Abhi ispe koi official information nahi mili hai.. Jaise hi milegi we'll try to provide the information to you. Dear Unknown Ji ! They will issue the list of the Winners who will get the highest points of that particular episode. If your name'll be there then they'll surely list your name as Episodic Winner! on Hotstar App pe dhangg se bhara/diya ho !!! Dear admin I won 72500 points today. Am I the winner? I request you please use your Name to comment! So that i could be easy for us to reply you all. First of all Congrats to score such an awesome score. By the way that is fault due to connectivity. As in some questions we have also faced the same things due to high traffic volume. I hope that your name could also be placed into the Winners list. Let's see the official result of that particular Episode. As soon as the official information for the result announcement will be there then you'll also come to know whether you are winner or not. Hi sir may i know that why still did not announced episode 18th 19th and 20th winners names? Hello Shekar Ji ! Wait for the official announcement..! They are trying hard to provide the better way distribute the prize money for each episode. Hello !! Sabse Smart Kaun Show mein Jaane ke liye aapko officially contact karna padega. We are here only providing the legit information about the SSK Play Along Game on HotStar app.Which we got to know from the Internet, or the official Tv show of Sabse Smart Kaun. Hello Nahid Ji.. Wait for the official confirmation for this. As soon as possible they will announce the result for each episode. Hope for the best! Thank you Admin Ji for the great initiative. Thanks Sabu Arya Ji ! Not able to registet bcz ph. No. Ya pan ki info dete hue inverse dikhai dete h. Jese mai 1234 likhu to vo 4321 dikhta h.. What to do? हेल्लो सर मेरा पॉइंट कितना है कैसे पता चलेगा हर दिन खेलता हूँ. Juma Soodha Ji.. Please check the Winner list on the HotStar App. I lognin as it was shown there but it is not showing my name it is showing anonymous there. I followed all the steps and have given all the details but still I am unable to get my name there please solve my problem I got 65000 points on Friday but because of that problem i couldn't get the price. 20 june k baad k winners kan announce honge?? Didn't understand your question. Have you scored 10,000 points or you have got any message regarding your Winning amount? Hello Vikas Kalra Ji ! Please update your Hotstar app and then again enter your Email ID/Login Details and then see whether you are facing the same issue or not ? If yes then it is surely the glitches in Hotstar app that is showing "anonymous" fpr you. Wait for the official fixes for this issue. Hey admin i got 36000point and 40000point in last 2 episode when will i get money. Hello ! Wait for the official announcement for the previous episodes. Hope they'll update it soon !